Who can resist cauliflower covered in a cheese sauce? 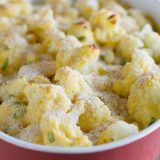 This Cauliflower Gratin has cauliflower covered in a creamy cheese sauce then sprinkled with breadcrumbs and baked for a veggie side dish everyone will love. Preheat the oven to 450ºF. Spray a 2-quart baking dish with nonstick cooking spray. Bring a large pot of water to a boil, then salt generously. Add the cauliflower and boil until tender, 6-8 minutes. Drain well, then transfer to the prepared baking dish. While the cauliflower is cooking, melt the 2 tablespoons butter in a large saucepan over medium-low heat. Add the flour to the butter and cook, whisking, for 3 minutes. Add the milk in a slow stream, whisking constantly. Bring the mixture to a boil. Reduce the heat and simmer, whisking occasionally, until slightly thickened, about 8 minutes. Remove the pan from the heat and add the cheese, scallion greens, salt and pepper. Stir until the cheese is melted. Pour the cheese sauce over the cauliflower and stir gently to combine. Sprinkle the breadcrumbs evenly over the top and bake until the topping is golden brown, about 10 minutes.